A brief look at the history of turquoise reveals it has been cherished for centuries. The 17th century word turquoise derives from the French word for Turks because the mineral was first brought to Europe from mines in Turkey. Even before it was named, turquoise was one of the world’s most popular stones. Its oldest known use was in Mesopotamia in 5,000 BC. Rulers there, as well as in ancient Egypt, Persia and China revered it as a holy stone. Native Americans believed turquoise was a sacred symbol of life. Some cultures thought when the stone changed colors it reflected a wearer’s health or unrequited love. 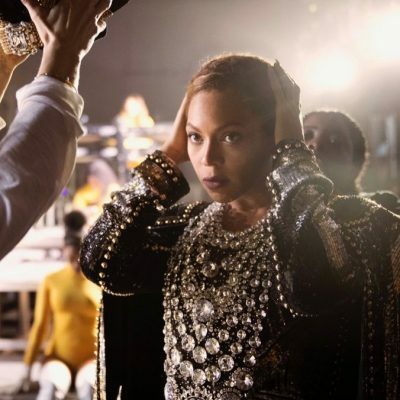 Now we know the color change is caused by oxidation from light or anything acidic including skin, sweat and cosmetics. 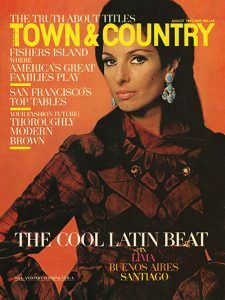 Carmen Mayrink Veiga on the cover of Town & Country (1967) in turquoise and diamond David Webb earrings. 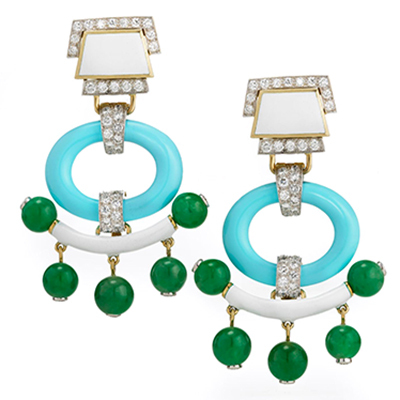 During the late 1950s and early 1960s, turquoise enjoyed a renaissance of sorts when many fine jewelry designers including David Webb created formal jewels with the gem. Actress Lana Turner wore David Webb’s turquoise, diamond and platinum earrings, necklace, bracelet and ring in the 1966 film Madame X. The gems in these jewels like most of the period were cut en cabochon because the rounded form compliments turquoise’s opaque waxy luster. 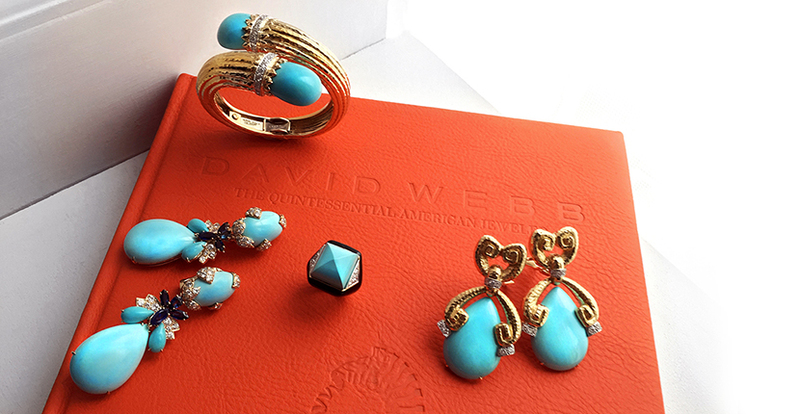 By the mid 1960s, the cultural climate change inspired David Webb to move on to his signature adventurous, bold style. 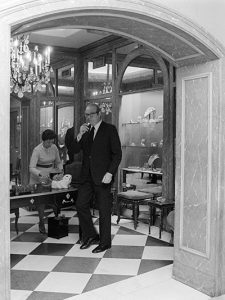 Glorious jewels from this period are still made today from the designer’s archive of original drawings on site at the David Webb boutique, located on the Upper East Side of Manhattan. For turquoise jewels, each gem is selected from a colossal cache kept in drawers and sorted by color. “Picking out the turquoises requires sorting through a hundred stones to find the right color matches,” explained Mark. When I asked to see some of Webb’s best turquoise earrings, Mark explained, “When you look at David Webb jewelry, you have to look at the evolution of the artist. What he was designing in the early sixties was more traditional, marked by an emphasis on organic and floral iconography. The late sixties and seventies offered up an evolution of form into the groovy and beautifully bold. 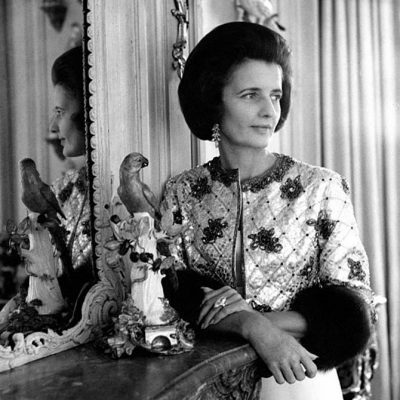 The jewelry developed muscle and became what David Webb is so well known for today.” On a 1967 cover of Town & Country Brazilian socialite, jet-setter, and member of Vanity Fair’s best dressed list, Carmen Mayrink Veiga wore David Webb’s turquoise girandole earrings, displaying a seductive insouciance that perfectly illustrates the mood of the era. Webb produced a series of graphic designs based on simple geometric forms in the 1970s. Some of these combined graphic black or bright white enamel and turquoise resulting in dramatically stunning contrasts. 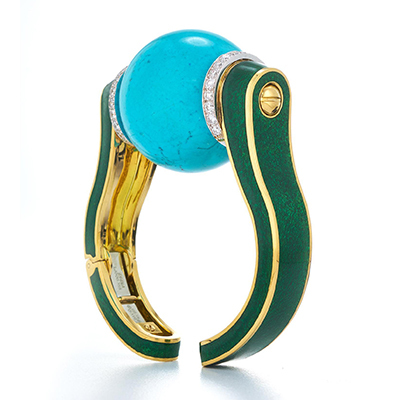 A sculptural bracelet originally designed at this time has a gargantuan turquoise sphere that evokes the blue domes of ancient Iranian palaces. The gem is flanked by lush green enameled gold sections that hug the wrist. “David Webb is a type of jazz in jewelry,” said Mark. “He treated colors and materials like a jazz instrumentalist would use notes. With turquoise, he created fearless riffs, amazing improvisations on the traditional styles.” It is the kind of music that doesn’t limit itself to a summer concert series. 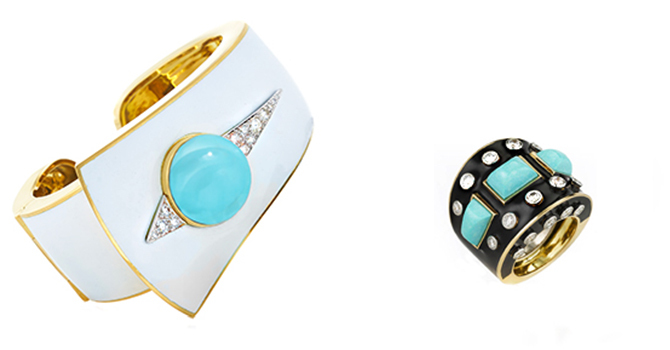 These incredible turquoise jewels could be worn all year round. *Very special thanks to Ruth Peltason, author of David Webb: The Quintessential American Jeweler (Assouline, 2013). Ruth’s book shed so much light on the rich history of David Webb and served as an indispensable guide in writing this story. Special thanks to Levi Higgs, archivist and social media manager at David Webb, for the research information and special photograph of the lead image at the top of this story.